I’ve just taken the cart buttons down for a little break, but if you need an order in the next few weeks I can take care of it for you — just send me an email. I know there are a couple of international people who want to time orders while they or their friends are here, and don’t worry, I can still do that. My assistant of over two years has just taken a well deserved full-time job, so she will no longer be helping me. I’m very sad to lose her, but I’m happy for her because she has a great opportunity. I’ll need to look for someone new, but I want to wait a few weeks because I hurt my left arm/elbow a few weeks ago and it has been getting worse instead of better. I’d like to take time out to get some PT. I realize that I’ve had a few of these episodes over the years and I apologize for that. It’s the unfortunate downside of being a one woman business and having some physical challenges. On the upside, I just sent out the first two testers of the floral and Amber Incense. I want to keep testing them myself and make some more samples to send out. Thursday and Friday evenings (8/15 and 8/16) Jessup Cellars in Napa hosted their Dress To The Vines event. As part of the event, Mary Orlin, Huffington Post’s wine fashionista, presented pairings of SSS perfumes with Jessup wines to create an olfactory learning experience. (I mentioned the event in a post a week ago.) Sounds like it went very well! I wasn’t there, but it had good feedback and was just written up on Scarlett’s An Effort To Evolve blog. Scarlett posted pictures of some of the fashion items presented at the event, and her writing makes for a fun read. I’m very glad people enjoyed the pairings! Edited to add: For those curious, here are some table signs I made that summarize the wine/scent pairings (pdf files that take a minute to download). For each of the four wine pairings, they set up a table with glasses of wine and scent strips. It’s an interesting concept that Mary Orlin devised, and I think she will do more of these pairings. Sheila posted a beautiful review of Forest Walk on The Alembicated Genie today. The theme is “In Search of Serene” and the post also includes Matsu by Dawn Spencer Hurwitz and Canyon Dreams by Keiko Mecheri. I love the topic, and it’s wonderful to be in such fine company! I took a quick trip to the local Farmer’s Market over the weekend and couldn’t resist buying a stalk of tuberose blossoms (I took a picture of them outside and posted it at left). 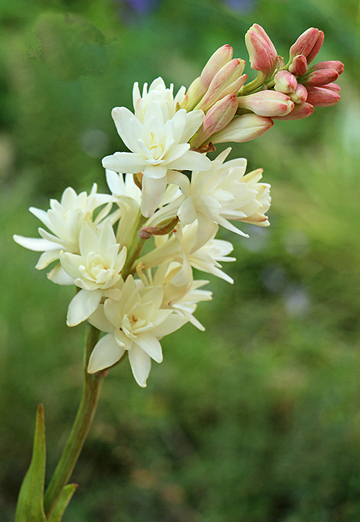 I’ve not grown tuberose here before but will have to try them sometime. This one wand of blossoms is perfuming my whole cottage — they are potent! It’s fun to smell the real flower after using the absolute. I’m sorry I’ve been scarce lately. I’ve been busy getting ready for next week’s event at Jessup Cellars in Napa as well as keeping up with orders. 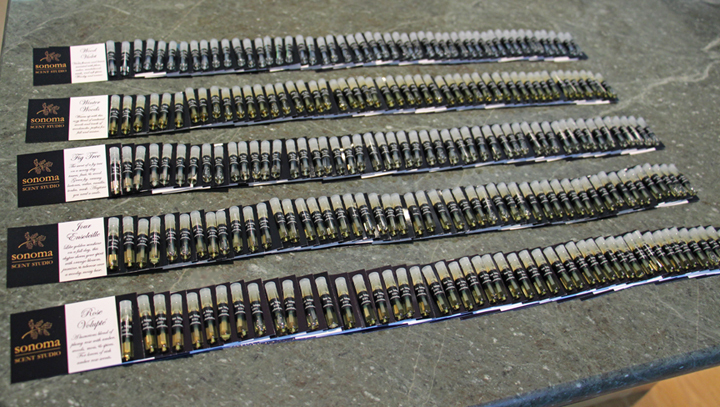 The photo above shows the making of carded sample sets for the Jessup event (before sorting into sets of five). I’ve seen a few interesting reads in the perfume world lately and wanted to post links for those who may have missed them. First, The Washington Post ran an article about a study into how genetics determines our perception of smells. We’ve discussed this topic here on the blog a number of times because I find it fascinating. Also, a link to a video discussing the state of affairs in the EU with more upcoming restrictions on allergenic ingredients. It says, “European negotiations are ongoing. An initial proposal restricting coumarin and twelve other allergenic substances to 0.01 per cent of a product looks like it has been dropped. This would signal a partial success for the perfume lobby. However, it looks like at least three ingredients will definitely be banned.” And, “It’s a breathtaking battle between well-organized business lobbies and patient groups, between scientific researchers and political powers. The new law will be on the table next year: will it signal the end of Europe’s perfume-makers? Only time will tell.” I wonder how all of this will eventually play out.